Tom Blundell has been Sir William Dunn Professor of Biochemistry at the University of Cambridge since 1995, and from 1 October 2003 Chairman of the Council of Biological Sciences in Cambridge. His research is focused on structural biology of cell regulation, structural bioinformatics and applications to drug discovery and medicine. 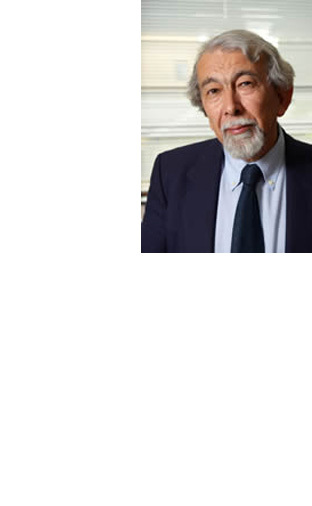 After research and teaching positions in Molecular Biophysics in Oxford and Biochemistry in Sussex Universities, he was appointed in 1976 Professor in Birkbeck College, University of London and in 1989 Honorary Director, Imperial Cancer Research Fund Unit of Structural Molecular Biology. Tom Blundell is a member of Academia Europaea, a Fellow of the Royal Society and Fellow of Academy of Medical Sciences. He has Honorary Doctorates from fifteen universities. Tom Blundell has played an active role in national science policy. In the 1980s, he was a member of the advisory group to the Prime Minister (ACOST). He was Director General, Agricultural and Food Research Council (1991 1994) and founding Chief Executive, Biotechnology and Biological Sciences Research Council, BBSRC (1994-1996). He was Chairman of the Royal Commission on Environmental Pollution, 1998 to 2005. He was President of the UK Biosciences Federation between 2004 and 2008. He co-founded Astex Therapeutics which has oncology drugs in early stage clinical trials in USA and UK. He was a Non-Executive Director of Celltech from 1996 to 2005 and has been involved in science advisory roles with Pfizer, UCB and SmithKlyneBeecham.